Oman Cancer Group, 2004, Hardback (Laminated Boards). Condition: Very Good. A nice copy of an uncommon title. Signed by the author on the ffep - unverified and reflected as such in the lack of premium. Dual language Arabic/English. 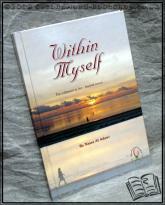 The Translation Group joined hands with the poet Nasra Al Adawi in "Within Myself'. They broke through the restrictions of language and created a bridge for poetry and thoughts that explore a different side of the illness known as cancer. The Arabic translation gave a wider dimension to the book so that it could reach out to all Arab readers, especially when it touches the human journey of turmoil and triumphs in creative and poetic language.